Gordon Ramsay is one of the most fascinating celebrities in existence and has demonstrated his great charisma, talent, and expertise several times over on his hit television shows Kitchen Nightmares and Hell's Kitchen . 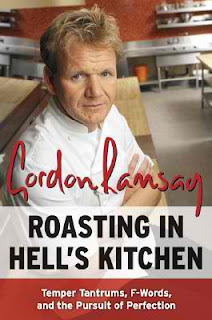 Ramsay's autobiography, Roasting in Hell's Kitchen , is worth the read regardless whether you're a fan of his or not because reading of his achievements is tremendously empowering and motivating. You can't help but have magnified respect for Gordon Ramsay after reading this book. Roasting in Hell's Kitchen is the success story behind a man that was raised in an alcoholic and abusive family and stumbled into the art of cooking by accident. Through hard work and dedication, this man became one of the world's most successful and renowned chefs. Gordon Ramsay has absolutely no shame in admitting that much of his hard work during earlier years was done to impress his father, which, after all is real and human. Ramsay's account of his childhood and young adulthood is very honest and honorable and describes how, in several cases, he worked twenty-hour days to learn from the best in the trade and master his craft. Roasting in Hell's Kitchen is one of very few books in existence that will sincerely engender and spark epiphanies -- and your creativity, when you read it. After all, why shouldn't we obtain professions in subjects that we truly enjoy and love to do best?! If you decide to pick up Roasting in Hell's Kitchen to further fuel your knowledge of his hit television series, you're in for a real treat because you'll appreciate Ramsay's persona and character that much more. On the other hand, as a literary experience, Ramsay's autobiography isn't flashy or self-indulging; but rather the honest and humble account of a real person who has worked hard to achieve his fame and fortune through genuine hard work. Gordon Ramsay also references food-columnist Nigel Slater in his book, whom, if you aren't already familiar with, wrote his own memoir called Toast (2005). Toast resided in my permanent collection for several years, and is also a very good read.